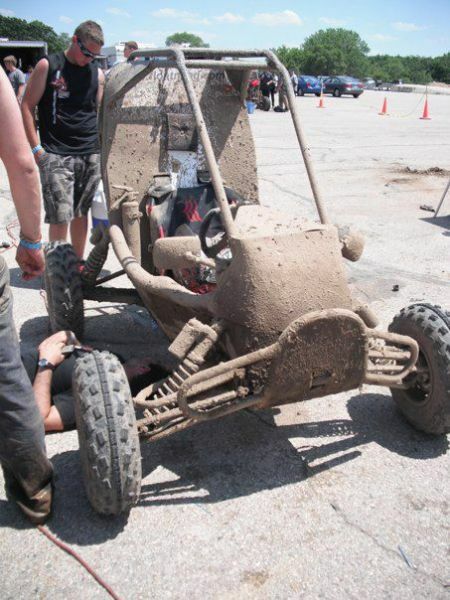 my school is new to the Baja SAE competition, we are unfamiliar with the rules. none of us are good welders and we decided to attach our skid plate on the frame drilling 1/8 holes every 3'' and using rivets to fasten them down. Is that correct of what can we do, we planned on doing the same to the body panels and the firewall? I'd suggest you learn to weld. It will save you often enough to be worth it. a skid plate should have long enough of weld bead, fair welds will do the trick so it's a good place to start practicing (plus nobody should see it). but are the rivets ok to use for the floor pan and panels? if they fall off, you will be black flagged. before asking questions, please familiarize yourselves with the entire rule book. read it multiple times, it is quite clear. if you have questions about the rules, please submit official clarification questions through the official rules questions channel on bajasae.net. there and only there can you get an answer from the official technical inspectors about whether or not you can do something. if you as a question on here and get a wrong answer and use that advice, you will not pass tech and they will just say "too bad, should have read the rules and asked questions to the correct people". Also as a side note, asking questions on this forum is fine for other things, though please dont post the same question twice in 2 different locations.